One of America’s most tireless and wide-ranging investigative journalists, David Barsamian has altered the independent media landscape, both with his weekly radio show Alternative Radio—now in its 33rd year—and his books with Noam Chomsky, Eqbal Ahmad, Howard Zinn, Tariq Ali, Richard Wolff, Arundhati Roy and Edward Said. His latest books are with Noam Chomsky: Global Discontents: Rising Threats to Democracy and Edward Said: Culture and Resistance. He lectures on world affairs, imperialism, capitalism, propaganda, the media and global rebellions. 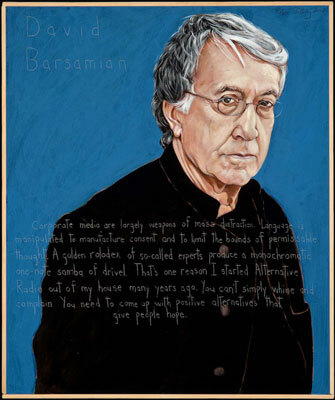 David Barsamian is the winner of the Media Education Award, the ACLU’s Upton Sinclair Award for independent journalism, and the Cultural Freedom Fellowship from the Lannan Foundation. The Institute for Alternative Journalism named him one of its Top Ten Media Heroes. He is the recipient of Lifetime Achievement Awards from the Rocky Mountain Peace and Justice Center and the South Asian Network for Secularism and Democracy. He has collaborated with the world-renowned Kronos Quartet in events in New York, London, Vienna, San Francisco and elsewhere. Thank You David! I can't tell you how many fired-up people I've heard from since your talk. What a great evening! Thank you David. You are a treasure for your ceaseless dedication and service so focused on exactly what the work needs . the voices of the most poignant luminaries of the world. It was great to see you again at the CCA, always! Your presentation was as rousting as it was informative. Thank you for gracing our town with your insights and wisdoms in these challenging times.